SlideShare is a web platform for hosting slides. Users can upload content prepared in PowerPoint, PDF or OpenDocument presentations. They can either upload files privately or publicly. Slide decks can then be viewed on the site itself or can be embedded on other sites. The platform is compatible with multiple devices such as mobile phones, tablet and other hand held devices as well as desktops. Why you should be using SlideShare? SlideShare has come a long way since it launched on October 4, 2006. On May 3, 2012, it was acquired by LinkedIn. The website gets an estimated 80 million unique visitors a month, and has about 38 million registered users. In an era of social media marketing, SlideShare presentations can help build your brand and grow your audience, if you do it the right way. Educational establishments can use it to enhance institutional brand image by promoting faculty knowledge. Consequentially, faculty can use it as a powerful tool to develop their own individual brand. SlideShare is a great tool to create branded content and expand outreach by putting PowerPoint presentations online. But the web space is overcrowded with half a million presentations added every month. So it’s important to work towards making a presentation that attracts users’ attention and interest. 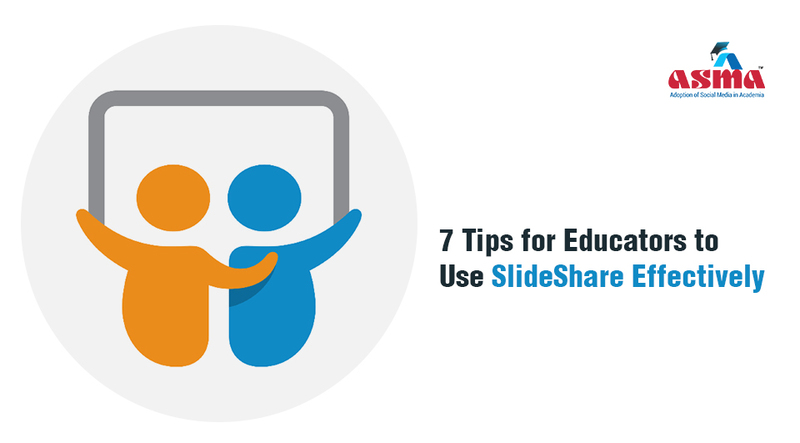 Here are a few tips for making good SlideShare presentations. Quality is more crucial in SlideShare than any other form of offline document presentation. Why? Because potential errors arising out of poorly drafted content in SlideShare presentation can’t be subsided with delivery of the instructor. On the other hand, while making a PowerPoint presentation, there is live interaction with your audience that comes to your rescue in case of any gap in quality and relevance of the content. Your SlideShare audience will be glued to their screens only if the content is interesting and sticky. Otherwise, you will lose them quickly. Check if your topic is already covered by someone else. If yes, re-draft the content. Customize your slides to suit the needs of your target audience. Look for an idea that no one else has thought of or has never been looked at from your perspective. Alternatively, you can also re-create your existing content and add a new flavour / angle to it. You can take topics that provide insights to a futuristic idea in your field of expertise and distil it for your readers in a simple and comprehensible way. Ideally, your presentations should create a knowledge hub where people can come to specifically educate themselves about new developments in their industry. Generate more clicks on your presentation by using clear illustrations and attractive images to capture attention. There are many good quality stock images sites for high definition pictures and vectors. LinkedIn SlideShare’s own data suggest that content with the right images gets 94% more views than without. To catch the attention of your readers, you can use following techniques for making clearly understood presentations. Present concepts and ideas into brief points. Then explain them one at a time. Try to avoid cluttering of information by writing lengthy texts. Use simple fonts with readable size. Use creative typography to highlight main points. You can get your message across effectively by limiting the word size. SlideShare recommends 30 words or less per slide — that’s the length recommended for a paragraph. You take up one idea per slide. If your presentation covers long explanations, try breaking it up. You can cover your ideas in more than one slide rather than fitting them into a single slide that might disengage your audience. Most importantly, apply the ‘MECE’ rule. This means that your slides should be ‘mutually exclusive’ but ‘collectively exhaustive’ in its content presentation. It may be an overused cliché but first impression is still considered to be the best impression. Put your best foot forward first to attract readers’ attention. Don’t just focus on eye catching title or a smart introduction but give your audience a reason to read your content. Think of it as a slide setting the context of the whole story in just one frame. Hence, the opening slide should be thoughtfully prepared. This is the best part of making presentations on SlideShare. LinkedIn SlideShare provides you a host of analytics including your top SlideShares, traffic sources, recent visitors, visits by country, and other engagement stats. The insights gained can help to customize content based on audience preferences. Comments on your slide decks can further help you to make changes and improve content next time. Educators can use SlideShare to grow audience size and drive traffic to increase brand visibility. Audience won’t forget presentations that can be used as a valuable source of reference by them. Once they like it, they’ll come back for more. Since SlideShare presentations are indexed by Google, it also helps to augment SEO and drive traffic to your website. Do not forget to include a call to action in your slide deck. It should inspire your audience to do something. Generally, call to actions should be marked towards the end of the presentation so that your audience do not leave too early. Call to action should direct your audience to explore more about your academic brand. You can include links to your newsletter, your Twitter feed or any place you want your readers to find you. Once your presentation starts getting noticed, link it back to your site. You can use SEO to promote your work. If you are sharing your presentation on the college website or social media, make sure you’re embedding links to the SlideShare presentation in the description. You can also upload your presentation on different educational portals and similar sites to increase outreach. Remember, more the links on different web platforms, the higher the search rankings. You can ask readers for email subscription. But, most importantly, give them a reason to do so. For institutes, SlideShare presentations can be a great tool to boost institutional branding, generate marketing leads and drive conversions. The teaching fraternity can use it to create individual brands and drive followers. By using the above-mentioned tips you can make effective SlideShare presentations that will market your expertise and create a brand out of it for people to partner with. How to Conduct a Successful Social Media Audit for Your University?